This oddity was published by Virgin in Europe in the early 1990s, about the same time as their individual Infocom Mastertronic packages. 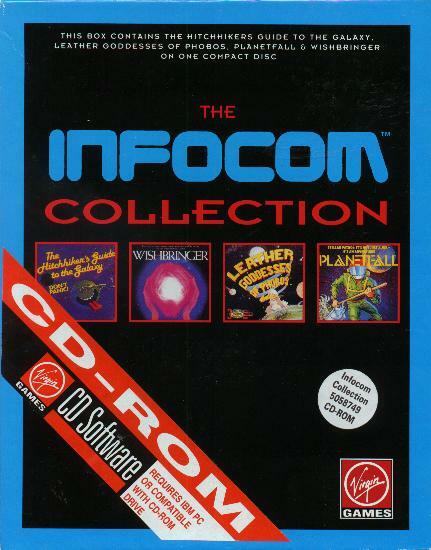 It contains four Infocom titles on a CD-ROM -- Hitchhiker's Guide, Leather Goddesses of Phobos, Planetfall and Wishbringer. Not a very effective use of the new (at the time) CD-ROM medium. The box contains the CD and jewel case with inlay, four manuals from each of the small black Mastertronic boxes, and Xerox of the Wishbringer letter and postal zones map.